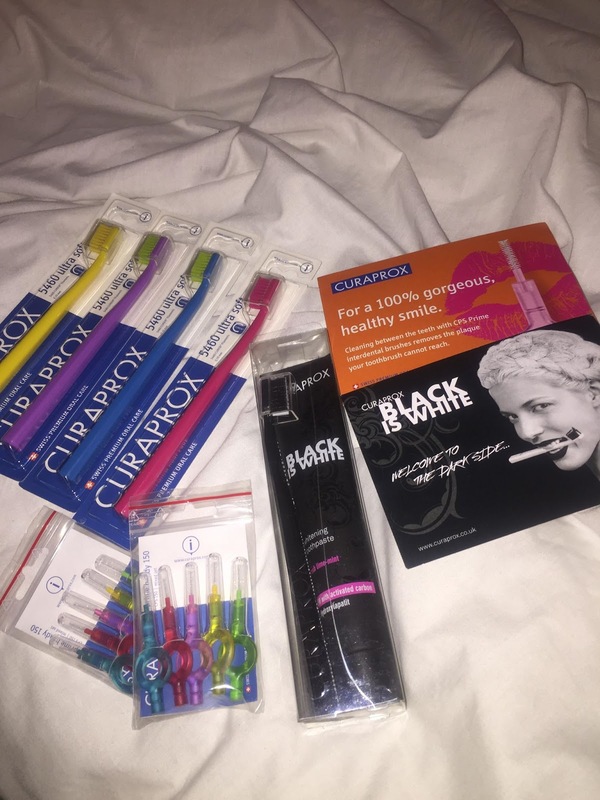 I was sent Curaprox Black is White toothpaste and toothbrush, Curaprox 5460 toothbrushes and the Curaprox interdental brushes. 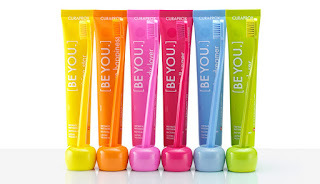 Firstly, I will talk about Curaprox's '5460 ultra soft toothbrushes'. I received a yellow toothbrush, a purple toothbrush, a pink toothbrush and a blue toothbrush. Although each of the four brushes were the same style and structure but in different colours, I have to admit the bristles on the end of the toothbrushes are a lovely material and texture when they're brushing against your teeth and do not scratch your gums or teeth unlike cheaper brand's of toothbrushes. You can really feel the amazing quality of the toothbrush while it's in use. Also, the width and length of the bristles are a great size, so when you apply toothpaste to the brush, you get just the right amount for an adult's mouth and all their teeth. the length and shape of the toothbrush and its handle are extremely comfortable to hold while brushing your teeth. Curaprox have a very simplistic but effective packaging. It clearly states what the product is, clearly shows what the product and has big, bold writing which encouraged me to look at the packaging more and read about it. I think the overall design is very neat and tidy with very clean presentation which draw's the consumer in. Overall, I think that Curaprox 5460 ultra soft toothbrushes are an amazing product and defiantly worth a purchase. The next Curaprox product I was asked to review was the 'Curaprox - Black is White toothbrush and toothpaste set'. The toothbrush in this set is the same style, design and bristle size as the 'Curaprox - 5460 ultra soft toothbrush' but it is in black this time, yet again I love the toothbrush in this set as it is just as amazing as the pervious product I explained. however, I love the toothpaste even more! 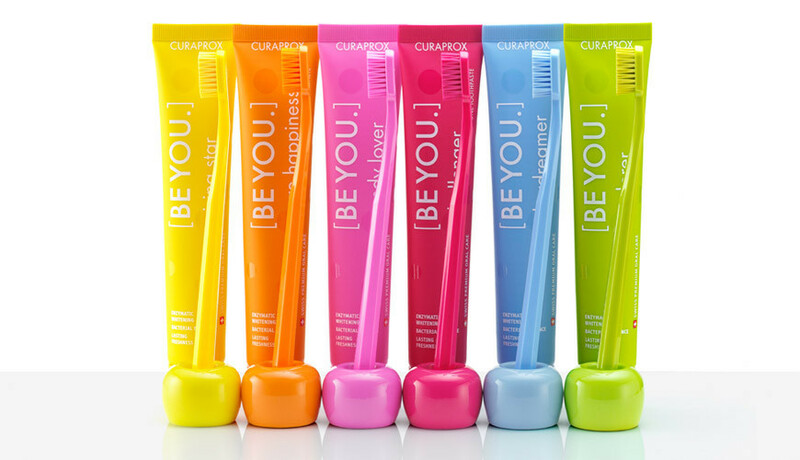 The toothpaste is a black formula with a very lovely scent and thick consistency that instantly whitens your teeth and you can see a clear change in the shade of your teeth colour over a few days of using the product. However, although your teeth do become whiter, I didn't feel like my teeth were 100% clean after it. Yet again, with Curaprox we have a very simplistic packaging with a see through box for the set. Inside of the outside packaging we find the toothpaste and toothbrush. the toothbrush is a plain, long, shiny black shape with a mate black toothpaste with shiny black detailing. although it is very simplistic, it is also a very pretty, clean and sophisticated packaging which I love and appeals to all genders and age ranges. overall, I really like this product and I would strongly recommend this to anyone looking to whiten their teeth while using an amazing organic product.